shows a historical map of the Mexico before Texas’ Independence and the Mexico-US War of 1846-48 had occurred. The offending map showed when the American Southwest – Texas, California, Arizona, Colorado, New Mexico, Utah, Nevada, and part of Wyoming – as we know it, belonged to Mexico. It was not until the signing of “Treaty of Guadalupe Hidalgo” that not only ended the war, but also defined our present-day borders. The ad was created by TBWA’s Mexican advertising firm Teran/TBWA. A year ago, Absolut vodka’s embarked in a new campaign strategy, breaking away from the old bottle series. The new Absolut World campaign invites the consumers to imagine their idea of a perfect world; a world that possibly wouldn’t take place but only “in an Absolut World.” The ad was solely geared toward the Mexican market. This all began when conservative columnist Michelle Malkin decided to use the ad to whip up anti-Mexican sentiment by dubbing the ad “Absolut Reconquista.” Soon after, the US media outlets noticed the ad. The outrage by the nativist over this ad has caused inspired an anti-immigrantion, FIRE Coalition, to start anti-Absolut website called AbsolutlyNot.com. 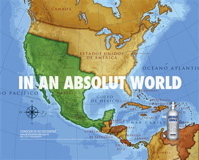 The group also created a new web ad depicting an “Absolut World” as today’s borders with a giant fence between the US and Mexico. The nativist group is also asking people to boycott Absolut Vodka and is demanded that person who approved an ad be fired. There is considerable anti-immigrant nativism here, as well as an ignorance about US history and how our imperialistic map got that way. The fact that most (especially white) Americans do not know, or prefer to forget, their brutal and imperialistic history in regard to Mexico makes it easier to rationalize these nativist attacks on an ad with an accurate map of what was once northern Mexico. In April 1846 President James Polk, seeking to gain “all Mexico” (as he and other U.S. imperialists said), sent U.S. troops into an area (“Texas”) recently taken by force from Mexico, and then on into an area of the borderlands he knew Mexicans had long treated as sovereign territory. Polk intentionally provoked a border clash between U.S. and Mexican troops, an incident that enabled him to claim, falsely, that Mexico had started a war. Later historians have linked this trumped-up war to the imperialist and racist notion that the U.S. had a right to move into Mexican territory as part of its “manifest destiny” to rule over “lesser” peoples. Together with many other European Americans, O’Sullivan argued that the U.S. government had a mandate to take the U.S. way of life to “backward” peoples such as Mexicans and Native Americans. I always find it interesting to read about colonizers being colonized, etc. And then with the ad, I don’t know—target the most vulnerable, destroy families, etc. That map? All the territories represent colonization, regardless of which area you look at—stolen territory, genocide (physical and cultural), and slavery…. North America has an ugly history all the way around…I don’t even know why the soil is brown and not red from all of the billions of pints of blood lost here…. In terms of the origins of whiteness, also interesting is the origins of public education and how it has evolved over the course of the last several centuries—and this is a bit off topic from the advertisement, yet is relevant to a part of the post above…. But the topic of whiteness and education could go on forever in terms of discussion on the exclusion and eventual inclusion of students based on race and gender, inequality, etc. but here I just wanted to quickly note something I read accented by a recent lecture. (and we know white males were the first to be educated, etc…) Frey (2005) explains: “Schools were first legislated in Massachusetts in 1647 to ensure that children learned to read the Bible as a way to thwart the devil (the “Ould Deluder” law), so that ‘learning may not be buried in the graves of our fathers in the church’ (Mongahan & Barry, 1999, p. 4)…children were often taught to read and write at home…” (Abbeduto & Symons 2008: 35). The lecture brought attention to how the physical setting of classrooms in current times have not changed much and still often resemble the Church (rows, teacher up front, etc.) as the schoolrooms in the first and early school houses were essentially replicas of the church houses with pews, etc. And…of course, most college and university rooms are similar….We tend to think so much has changed, etc. (There are other ways to structure classroom settings besides the traditional, which could be much more effective for teaching and learning purposes). But, I do have an appreciation for many theories from different disciplines and one happens to be Chaos Theory, sometimes referred to as the “Butterfly Effect” (of which the founder of this theory, Edward Lorenz, passed away last week—but most certainly and obviously ties back to Eastern thought in many respects—if you don’t know this theory, don’t learn it because it will completely screw you up metaphysically speaking in terms of general decision making in everyday life, etc., though if you’re an activist and open-minded (there’s two primary metaphysical arguments that scholars work from whether they realize it or not, which are Determinism and the Free Will argument—then there’s Choas, which takes into account the possibility of randomness…long story), but you might want to know it…). But back to the religion and education, working partially from the Butter Fly Effect here, the public schools as known today were founded on this white or Anglo-Saxon foundation that began very small (and certainly with primary focus and emphasis on Providence and manifest destiny as noted above) gained momentum, grew and now through institutionalized social structures funnels the masses beginning at early ages back into it and socializing essentially whiteness (I would argue) to all who enter, etc. And I might add, civil religion is alive and well (which seems very much invisible and serves to both directly and inadvertently reinforce whiteness…and in many respects still Providence and Manifest Destiny—even though theoretically there is supposed to be the legal separation of Church and State) and uses the education system as a primary venue to reinforce the entire foundation…. (and I know, perhaps obvious stuff in the whiteness literature…). And lastly, little work has been done on Providence believe it or not…and a great Philosopher said he was going to do some work on Providence over this last semester and it would be ready for in house reading about this time and should be published towards the end of the year…so anybody interested in this should really check it out in the near future….